ADHD Justice Support Center » What is ADHD? What this means: Chemical signaling in the nervous system operates differently for those with AD/HD. (Not necessarily better or worse, or more or less intelligent- just different.) And while environmental factors may influence how the disorder manifests, ADHD is primarily caused by genetics. Among parents who have ADHD, 57% of their children will also have it. Of those with ADHD: about 80% are born with the disorder and 20% may acquire it later on. 1 A small portion of those with ADHD may develop the disorder due to prenatal issues or complications at birth- e.g. smoking while pregnant, complications/trauma during labor. Chemical signaling in the nervous system operates differently for those with AD/HD. AD/HD affects the frontal-striatal-cerebellar circuit (FSCC), a neurotransmitter pathway through the middle of the brain. Compared to those without ADHD, the FSCC shows decreased activity, is smaller or has structural differences. The dopamine brain circuit acts much like the fine tuning dial on a radio: it enables the brain to focus on a signal and eliminate static. When there isn’t enough dopamine the brain’s ‘tuner’ is impaired. This results in ‘noise’ or ‘static,’ experienced as distractibility and bombardment by both internal and external stimuli. The brain compensates for low dopamine levels with greater sensitivity to external stimuli, making people with ADHD even more vulnerable to distractions. Another function of dopamine is to signal the brain when something is rewarding. Rewards are objects or events that make us come back for more. They teach us how to make good behavioral choices, and as such they are essential for survival. People with ADHD are less sensitive to rewards- resulting in theneed for more frequent, novel, and intense rewards to become and stay motivated. This can lead to sensation-seeking behavior, such as substance abuse. 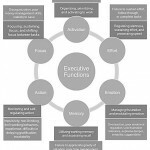 The executive functions are a set of neurologically-based processes having to do with managing oneself and one’s resources in order to achieve a set goal. 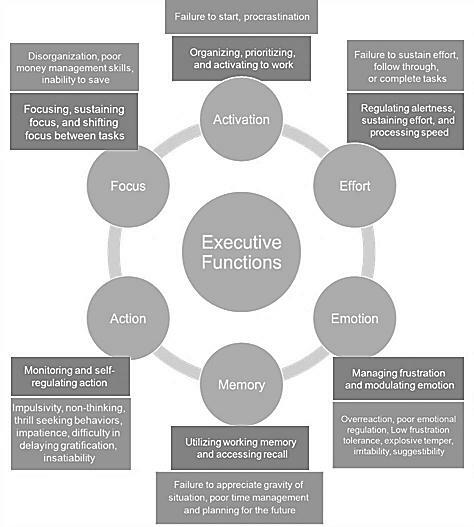 These various brain mechanisms that prioritize, integrate, and regulate other cognitive and behavioral functions. Selective attention allows us to focus on one task at a time. When this ability is impaired, it results in easy distractibility. Sustained attention describes the ability to stay on task and complete that task. When this is affected, it results in motivational impairment. Many individuals with ADHD also have a working memory deficit, which results in chronic forgetfulness andprocrastination. A reward deficit makes individuals with ADHD less sensitive to reward and reinforcement. This results in boredom, impatience, and a focus on immediate reinforcement. Excess energy, fidgety, difficulty sitting still or staying seated. NB: A diagnosis of ADHD can only be applied to individuals who consistently experience 6 or more of the DSMIV’s symptoms to a debilitating degree over a period of at least 6 months. These impairments increase the risk of academic, professional and personal issues for those with ADHD- especially when left unrecognized and untreated.